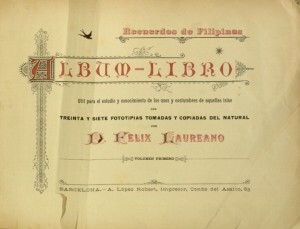 Title page of Recuerdos de Filipinas by Felix Laureano. 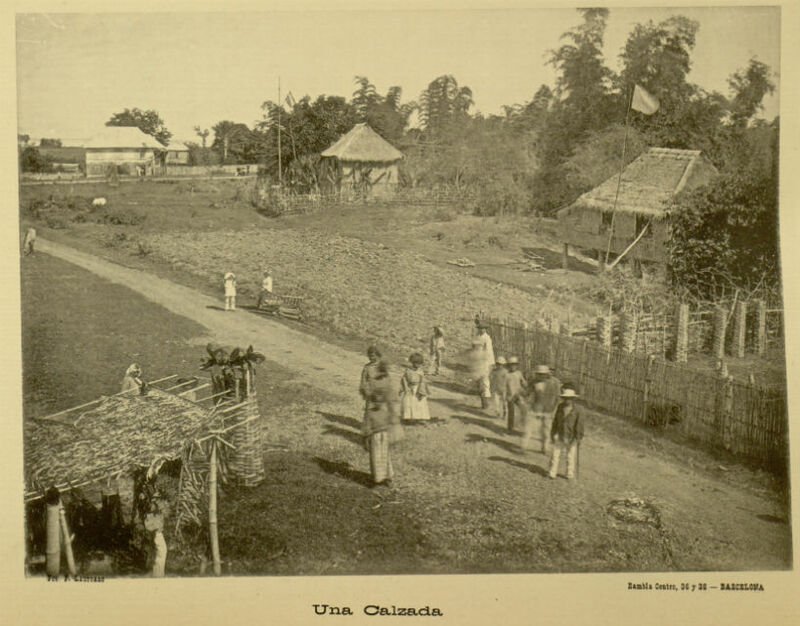 We recently digitized Recuerdos de Filipinas : album-libro : util para el estudio y conocimiento de los usos y costumbres de aquellas islas con treinta y siete fototipias tomadas y copiadas del natural (Memories of the Philippines : album-book : a tool for the study & understanding of the ways & customs of these islands with 37 phototypes taken & copied from real life) by Félix Laureano. 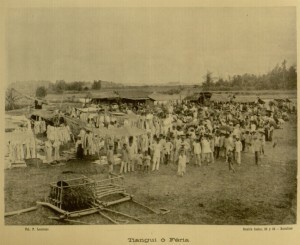 This album was published in Barcelona in 1895, depicting in photographs and essays the daily life and customs of the people and landscapes of the Philippines, at that time a colony of the Spanish Empire. The book was recently translated into English and edited by Felice Noelle Rodriguez (Anvil Publishing, 2014), so it continues to provide interesting insight into the late-19th-century colonial days of rural Filipino life. Una calzada. A carriageway between towns. 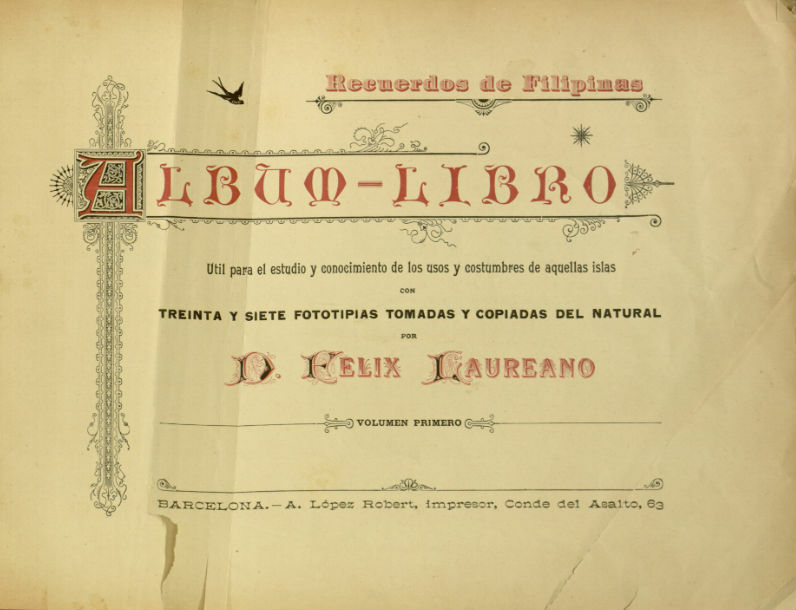 Laureano was one of the first photographers of Filipino birth. It should be noted, however, that although Laureano was born in the Philippines, it is not known whether he was criollo (of Spanish descent) or mestizo (of mixed heritage). There are no known photographs of Laureano himself. Despite the title “Memories of the Philippines,” Laureano’s photographs and essays focused primarily on the Iloilo region of the island of Panay in the Philippine archipelago. This was the area where Laureano was born. In contrast, most other contemporary photographers focused on the capital city of Manila on the island of Luzon. Laureano moved to Barcelona to publish his album-book, where he also established a commercial photography studio called Gran Fotografía Colón. 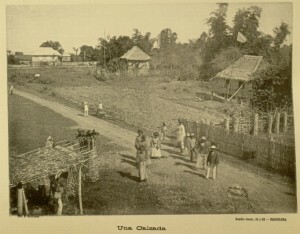 This was one of the first published books of photographs of the Philippines. Although Laureano claims that the photographs are “natural,” the photography process at the time meant that portraits had to be at least minimally staged. Tiangui o feria. A town fair. It should be noted that although Laureano clearly loved his native island, he also demonstrates biases against the indios (indigenous people) and the Chinese, as well as exoticizing some of the women. It is also important to note the historical context of this album-book. The book was published just over a year before the Philippine Revolution, which began in August 1896, so it seems likely that the islands were not quite as peaceful and content as Laureano depicted. The Philippine Revolution resulted in the withdrawal of the Spanish colonial government, although “possession” of the island was then transferred to the United States. The Philippines finally gained independence in 1946. Although the title page calls this “volumen primero” (first volume) and there is an advertisement for a second volume in the back of the book, there is no evidence that a second volume was ever published. In addition, our particular copy is missing pages 107-108 and may be missing a prologue as well. Vista de la Catedral de Jaro. 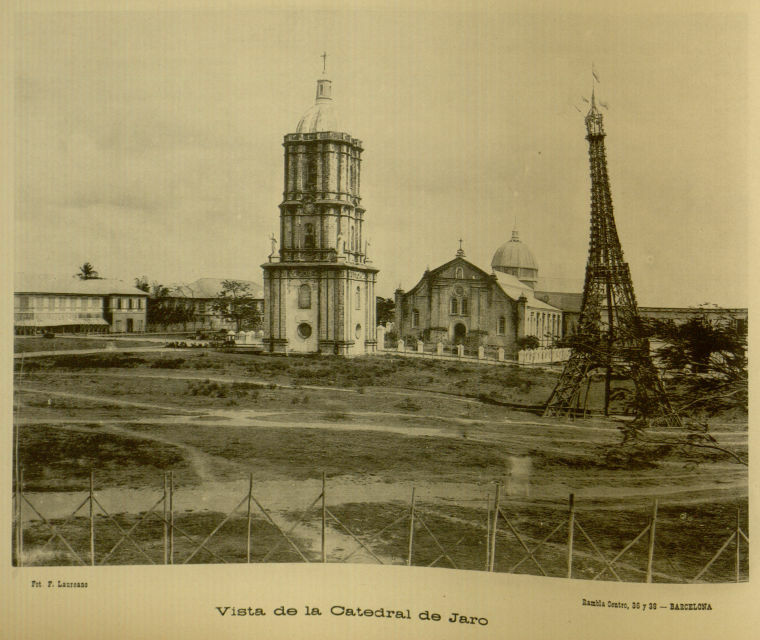 View of the Cathedral of Jaro, with an Eiffel Tower reproduction made out of bamboo canes. This is nice, very nice. I hope more to read it. Lo que realmente falta en su copia son las páginas 108-109. Se trata de un error de esa edición ya que la hoja que en el anverso tiene la página 107 en el reverso tiene la 110. Por otra parte indicarles que no le falta ningún prólogo.